I did a “quick and dirty” version of my cooked bean mix for my birds. I wanted to make them today and I had to go to the store for beans so rather than soak them overnight, I did a “fast cook” version of my usual method, drained and rinsed them and then added the other ingredients. Normally I soak them for about 8 hours in cold water and rinse repeatedly. But you can do it this way if you don’t have the time or did what I did and forget to soak them. I would like to thank and acknowledge Shari Mirojnick for her knowledge and influence on this bean mix recipe. It was her input and method that the bean mix I made has improved. She has been making a bean mix for her birds for over ten years now. Pure and simple, lentils are a powerhouse of nutrition. They are a very good source of cholesterol-lowering fiber. There is no cholesterol content in lentils, yet at the same time, they are very low in saturated fat. Another important nutrient that lentils are rich in is thiamin. Lentils are also high in folic acid, contain antioxidants, calcium and are rich in vitamin B. They are good sources of important minerals like iron, magnesium, and zinc. Quiona is high in protein and includes all the nine essential amino acids supplements. It is a popular choice for vegans, as it helps them take in the adequate amount of proteins, a sometimes tricky thing if you are vegan. It is gluten-free and it a wonderful source of phosphorous, magnesium, zinc, copper and manganese. It contains vitamin B6, niacin and thiamine. It has lysine for building proteins in the body, also contains riboflavin, (vitamin B2) an extremely important vitamin for producing energy. Barley is absolutely loaded with fiber. It provides insoluble fibers that help feed friendly bacteria in the digestive tract. This helps maintain larger populations of friendly bacteria. What this does is crowd out disease-causing bacteria and prevents them from surviving in the intestinal system. Barley is also a source of niacin, a B vitamin. Barley is also a good source of niacin, a B vitamin. High in fiber, high in protein, Beans contain no cholesterol, Most beans contain at least 20% protein and are quite high in carbohydrates. This provides longlasting energy. Beans also provide essential B Vitamins and Iron. Wild rice is actually an aquatic grass. It contains more Niacin (also known as vitamin B-3), than brown rice and it’s an excellent source of other B vitamins, such as calcium and potassium. It is a good source of fiber, it’s high in carbohydrates which is great for boosting your bird’s energy. Looks good! By that I mean I think I would find it tasty. I LOVE beans. Chris, it’s pretty good! To serve it to us we’d need salt, but it has all kinds of good flavorful stuff and it could be easily converted to a really good dish for the Human table. I actually try all of the stuff I give my birds. To my taste, it would need salt, but that’s out for the birds of course. It’s a good solid dish for the birds, and loaded with nutrition. Since our feathered pigs are famous for helping themselves to our plates of food, I guess I can say I eat a lot of their food too. LOL Having birds has certainly improved my diet. My wife cooks everything to be healthy so we can share with the flock. Looks great! I’m going to mix mine this way from now on. Mine is usually very boring! Lynne, I’m so happy the video gave you some good ideas. there’s all kinds of things you can do to change up the taste for your flock. It’s just so good for your birds and it’ll get you more involved with them because all of the food in freezer frees you up to spend more time with them. It’s all good! “Most” beans are good but there are a few “no-no’s”—like kidney and lima. It depends how long you cook them, I think. I have been serving a 15 bean soup mix for ages and I’ve never had an issue. Is there a reason for making the bean mix separate from the chop ? can i add the beans to the chop mix and mix it together? Yes. I make them separately because I don’t serve the bean mix at every meal. My reasoning is this: You eat roast chicken, mashed potatoes and green beans separately at dinner. You also don’t just mix a bunch of food together, say eggs, bacon, toast, roast chicken, potatoes and green beans all together and eat all all of this at every meal, although you could and you’d be fine. Separate dishes adds variety to their meals. Sometimes you put bean mix in with their chop, and sometimes you add sprouts along with nuts instead of the bean mix. Although it might be convenient, making it separately is just a nice thing to do for your birds and makes meal time more exciting because they don’t know what they are going to get. Adding variety is just part of making it fun and different. We don’t eat the same thing every day. 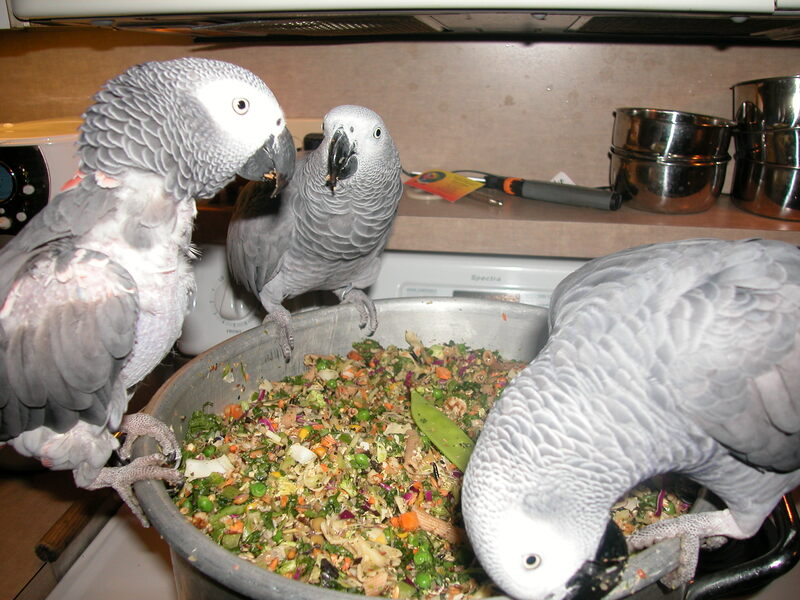 Parrots in the wild eat what they can find, what’s in season and what’s available. I believe this adds interest to their meal and makes their meal more fun. It also gives them a choice as to what to eat first. I don’t know, I just believe choice is important to them and empowers them in a world where they have very little choice relative to our world. I just believe it’s a nice thing to do. Patricia, I so appreciate your sharing this! I can’t wait to make it for my flock…looks and sounds good enough for me too………..I love beans……..lol. I soaked my 15 bean mix and only 2 hours in many looked wrinkly and split? ?